In the month of February we are often reminded of just how much we love our dogs. To return a small portion of the unconditional love that our dogs show us, we can help them improve or maintain a healthy heart. There are several dog treat ingredients that can aid to a healthy heart. They include olive oil, fish oil, canola oil, taurine, and flax seed. Since many dog treat recipes may already use the above mention oils, we wanted to focus on taurine and flax seeds. 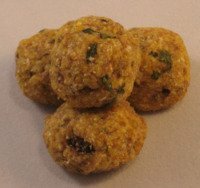 Tripe Pom Poms - Green tripe contains taurine, and although it's a little smelly, you must give this dog treat recipe a try! I can almost guarantee that you have never seen your dog quite as happy as you'll see him after he's tasted these treats. These treats also make fantastic training treats. They are small for frequent training rewards, and since they are so flavorful, your dog will gladly pay attention and do what you ask for these tripe cookies. 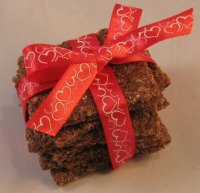 Cheesy Flax Seed Squares - Flax seed is a heart healthy ingredient. 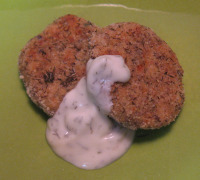 It's loaded with omega-3 fatty acids for the heart, skin, and coat. Your dog may not have a taste for flax seed, but she'll love the cheesy flavor added by the Parmesan. Did you know you needed to brush your dog's teeth, provide toys and treats to help them clean their teeth? If you've been putting off taking care of your dog's teeth, now is the month to get started. The American Veterinary Medical Association has a great video to show you how to brush your dogs teeth. Mint Kiss Dog Cookies - Cleaning your dog's teeth is important. But to help with a little doggie breath, try our mint kiss cookies with fresh mint and a little cheddar cheese. Has your love of baking treats for your own dog extended to making treats for all dogs? If that's the case you may have considered starting your own dog bakery business. I've bought, read, and reviewed a great e-Book on How to Start Your Own Dog Bakery. Actually I've bought and read three of the most popular dog bakery books, and I like this one the best. When you're just starting a new venture, the best thing you can do is plan. There are many well written business books on the market, but you will also need to read a book all about being a successful pet-trepreneur! :) So, read my review of this eBook How to Start Your Own Dog Bakery: A Guide for the Animal-Loving Entrepreneur and see why I think this is a great book for starting your own dog bakery. "My dog LOVED the Peanut Butter & Molasses dog treats. He was licking the crumbs off the floor!" "Thank you so much, I'm so glad you have this site, I love your ideas." Since March is National Peanut Butter Month, we're going to explore even more dog treat recipes with this all time favorite dog treat ingredient.